We are a non-profit, social club run by member volunteers. We currently have a membership of over 200 women from over 20 countries and provinces. Our club provides women an opportunity to meet and socialize with other women. We have many members who are expats from all over the world and other Canadians who have recently moved to Calgary. We’ve been around for 58 years! Founded in 1961 by Kay Dant, we were the first Newcomers’ Club in Canada. Why the white hat in our logo? 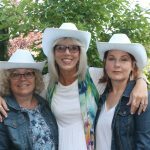 The Calgary White Hat recognizes great ambassadors of hospitality and is the symbol that showcases the four key values of hospitality – integrity, western hospitality, pride of place, and commitment to the community. You will also see the hat on our city flag, in the airport and during the Calgary Stampede.